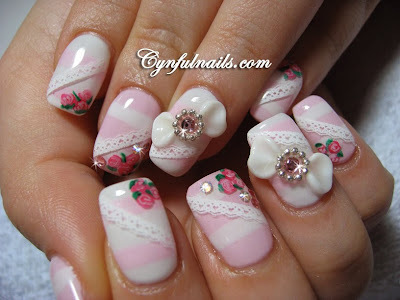 Cynful Nails: Of roses, lace and everthing girly. Of roses, lace and everthing girly. Now, this looks really pretty isn't it? Simple stripes on the tips with roses and crystals. Thumbs have the same design as the ring finger. *All gel colours used only. *Some designs are modified and referenced from Nail Max/Nail Venus. So cute! I love your floral prints. did you really do these? theyre absolutely amazing!! Those roses are soooo lovely!! I love this last manicure. Gorgeous!